Announcing Five FREE Workshop Winners! I love this time of year!!! Happy Thanksgiving to all of you who celebrate it and to everyone else around the world, I hope the season finds you safe, in health, and in good spirits. I’m so grateful for many things and Thanksgiving is a great time to remember to give thanks to those people and things in our lives that we love (that’s true every day). Along those exact lines, we have officially begun the countdown to the announcement of the 2019 straw bale workshop schedule. We want to take this opportunity to thank you for your support and engagement. 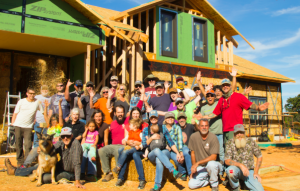 I feel honored to have met and worked with so many of you and I look forward to sharing a straw bale workshop experience with both old and new friends again this year. 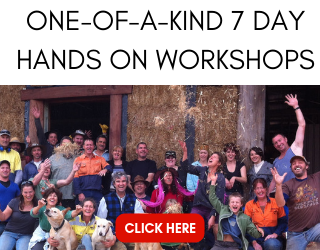 In case you don’t know, the straw bale workshop schedule announcement goes hand in hand with the launch of our annual WORKSHOP SALE! As our way of saying thanks, you can save hundreds of dollars on tuition and secure your favorite spot before classes start filling up. We’ve got an amazing line up for you this year. We can’t wait to share it with you..but we are going to do just that: wait! The sale will begin with the big announcement of the locations at 8am Pacific Standard Time (PST) THIS FRIDAY, November 23rd. 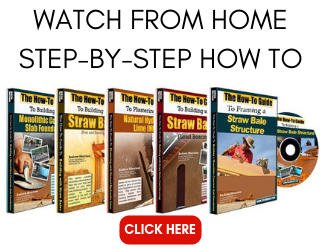 Bookmark THIS PAGE so you can go directly to the straw bale workshop description page when it’s up. I guess my hints were a bit too hard this year. I must have overcompensated for some of the easy ones last year. Sorry about that. Believe it or not, there was only ONE PERSON who got all the answers right out of many entries. Special kuddos to Hanna N. for being the only sleuth with the nose for the answers! 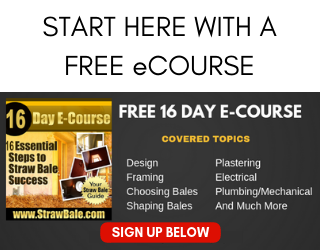 Fear not, for those of you who didn’t get all of the answers right, there were still FREE straw bale workshop winners. Consider it the teacher’s curve. I created a random drawing from all of you, simply for playing along! So this year’s winners are…. Congratulations!! Now before you get super excited, there may be several Lisa V.’s out there, or even Klaus W.’s. I will send you a quick email to let you know that you are the official winners (you may have received it already). When you get that…THEN you can celebrate! Thanks for playing everyone. Be sure to check THIS PAGE on Friday morning at 8am PST to see the answers, choose your favorite location, and sign up for a week you’ll never forget.